Wred Fright's Blog: Good Grief! 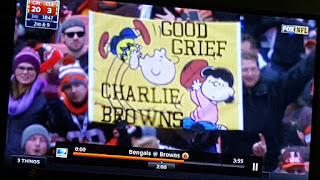 The Cleveland Charlie Browns! Good Grief! The Cleveland Charlie Browns! I was selling some old stuff on eBay recently (feel free to buy it here) when I found in the box an old Youngstown Vindicator from 2004 wrapping up some glassware or whatnot. I glanced over it and enjoyed reading an article in which a sports columnist advises The Cleveland Browns on whom to draft. He advises them not to draft Ben Roethlisberger because "they're not in a position where they can waste a No 1 pick on a project. In addition, I think it would be a major public relations disaster if the Browns took the Miami (Ohio) signal caller. Even though, he's a local kid, somewhat, Browns fans are astute enough to realize there are more pressing needs on this team." The Browns apparently listened to the advice of the sports columnist since they picked Kellen Winslow II instead of Roethlisberger, which in hindsight I think we can all agree was probably not the best choice as Roethlisberger has, of course, gone on to play in three Super Bowls, winning two of them, meanwhile The Browns have gone through 21 different starting quarterbacks and 10 losing seasons since Roethlisberger started playing for The Pittsburgh Steelers. In fact, just yesterday, I watched The Browns get destroyed (see a picture above courtesy of my pal Nick) while Roethlisberger led The Steelers to an easy victory. I hope that The Browns don't listen to that sports columnist's advice for this year's draft! I would suggest that they just give up trying to guess whom will or will not be a good prospect since they are terrible at it for the most part and just draft anyone whose last name is Brown. Conceptually, having a team composed of players whose last name is Brown would be kind of fun. After all, the two greatest football legends associated with the team are arguably Paul and Jim Brown, so why not double down on the name? The results couldn't be much worse than this year's, could they? Good grief! Happy 2016 & Cool Yule! Crazy Carl Meets An Emu! New Pop Lit In Print!